Anyone catch the Seahawks game last night. Last play of the game, what a crock of ****! I'm a hawks fan but c'mon these refs just threw the game. It's time for the NFL to make a deal, game after game these refs are proving what a joke they are and last night was the icing on the cake. Any comments? Anyone can make a bad call, it happens. 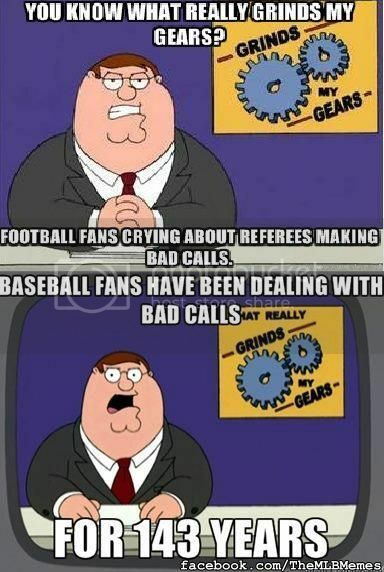 But instant replay is there so you can look at all the evidence you might have missed to fix the call if necessary. On that final play, the refs must have seen something no one else saw, because I dont think anyone else in the world thinks Seattle came down with that ball. The most profitable league on the continent is holding out on the zebra's over very little money(relative, of course) and is hurting its reputation while doing it. Unbelievable call. It happens but really terrible here. Just caught the last little blip on sports talk, sounds like theyre back at the table... at least theyre talking again. These players are like kids with a substitute teacher, just keep pushing their luck. Hopefully mondays game was enough to get the refs the deal they deserve, before someone gets hurt because of it.